Styletech PHA10 Photoluminescent Film is a high performance, high energy photoluminescent acrylic film designed for safety and emergency exit signage. Common uses include marking the steps, landing and handrails in exit stairs. 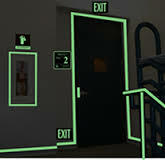 Other applications may include outlining an exit door frame, marking door handles, applying cutout footprints leading to an exit or providing a graphic or sign with additional instructions. 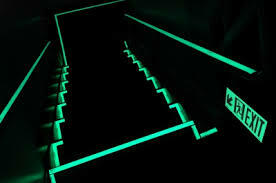 The proper use of photoluminescent tapes will help to identify the safest exit path in a suddenly dark environment and direct the occupant away from potential hazards. 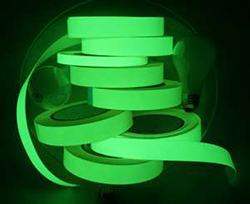 Once the Styletech PHA10 Photoluminescent film is fully charged, it will glow continuously for hours and is seen best and at greater distances when the room is dark. AVAILABILITY- We stock 1" and 2" in 150' rolls and these can be wound to other lengths as needed. We also stock 15" punched, 24" unpunched and can produce most custom sizes up to 48" wide and 750' in length.